Impressive inside and out, Hagia Sophia is a crowd pleaser and is on every Istanbul tour schedule. 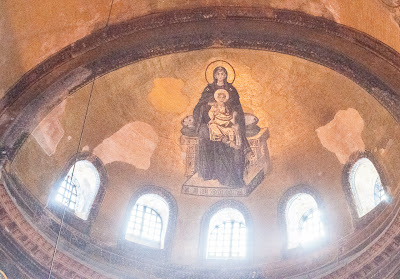 Hagia Sophia was choosen as a world heritage site by UNESCO in 1985. 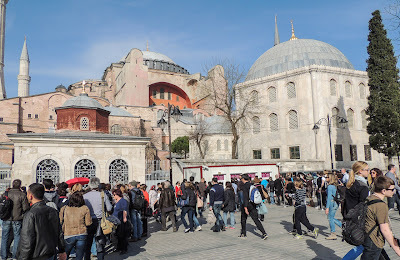 Moe and I were discouraged by the long lines and delayed seeing Hagia Sophia while touring Istanbul on our own. We joined our OAT (Overseas Adventure Tour) tour of Turkey on Monday evening and visited Hagia Sofia on Tuesday. 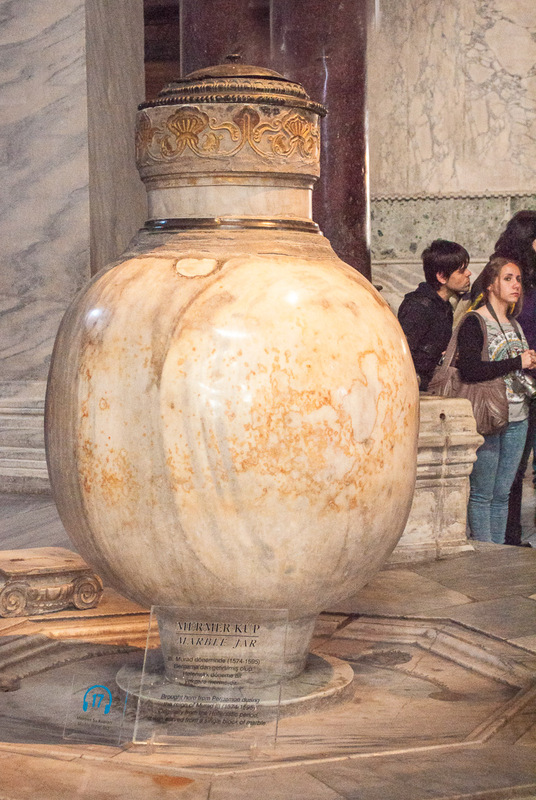 The museum opened a new entrance for groups that very day, so our tour breezed in; our wait time just a few minutes! Stepping in side I was amazed by the vastness of the space, especially vertically. It is beyond the scope of my vocabulary to describe Hagia Sofia; it is also beyond the capability of an ordinary camera to capture the immensity of the dome. 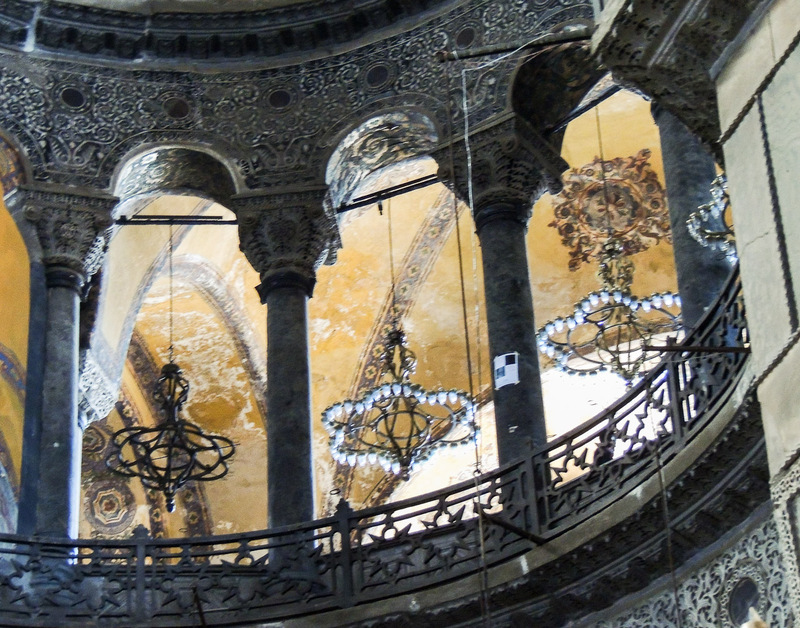 Once a church, later a mosque, and now a museum of the Turkish Republic, Hagia Sofia is a masterpiece of Byzantine architecture. 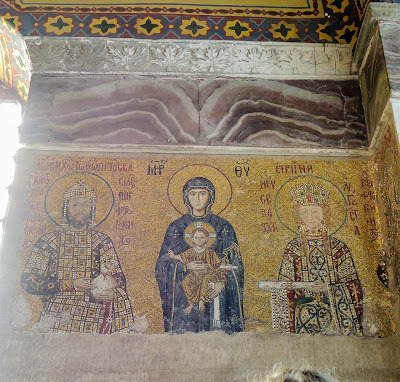 It was built on the orders of the Byzantine Emperor Justinian and was the largest cathedral in the world for 1000 years until the Seville's Cathedral was built. 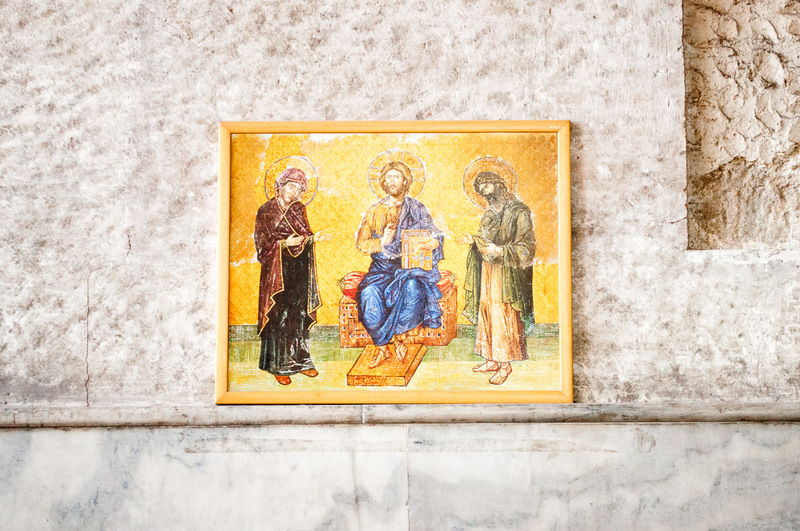 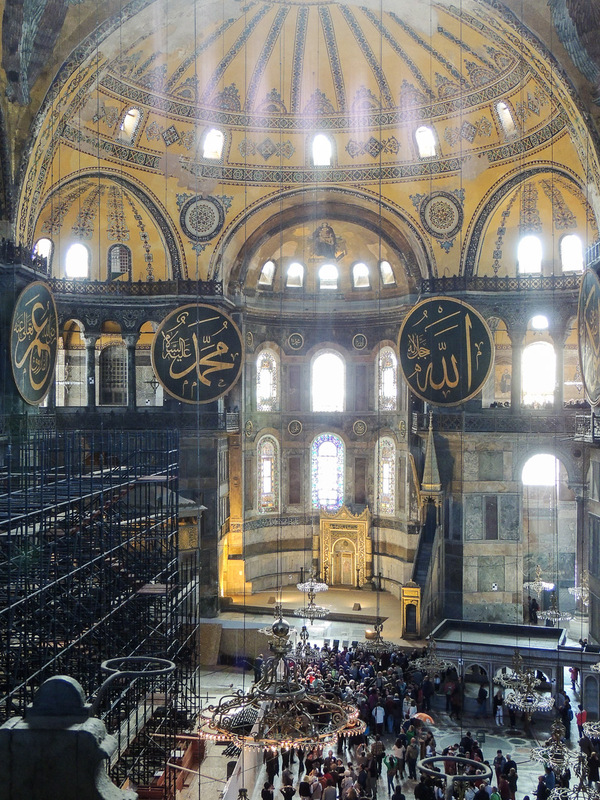 Hagia Sofia has undergone many renovations. 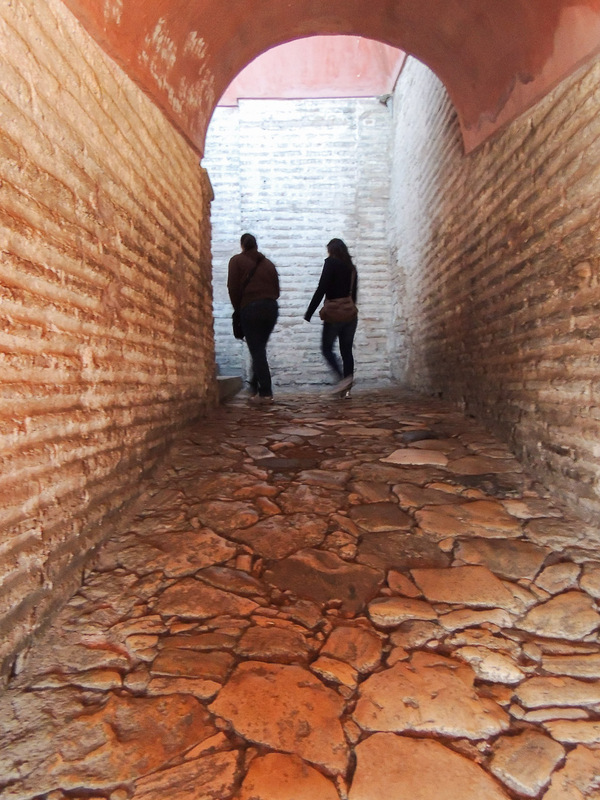 Moe and I speculated about all the bricked-in arches and doorways below. 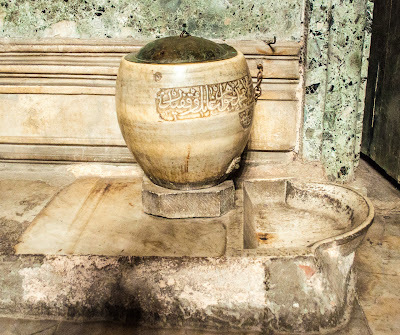 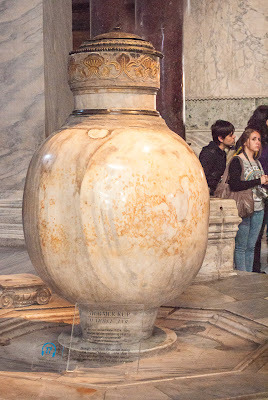 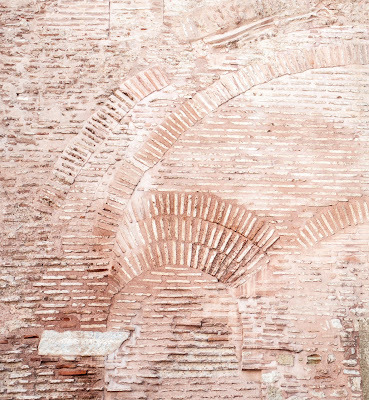 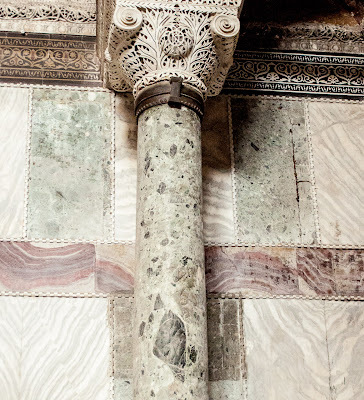 When the city was conquered by Ottomans, Hagia Sofia was converted to a mosque. 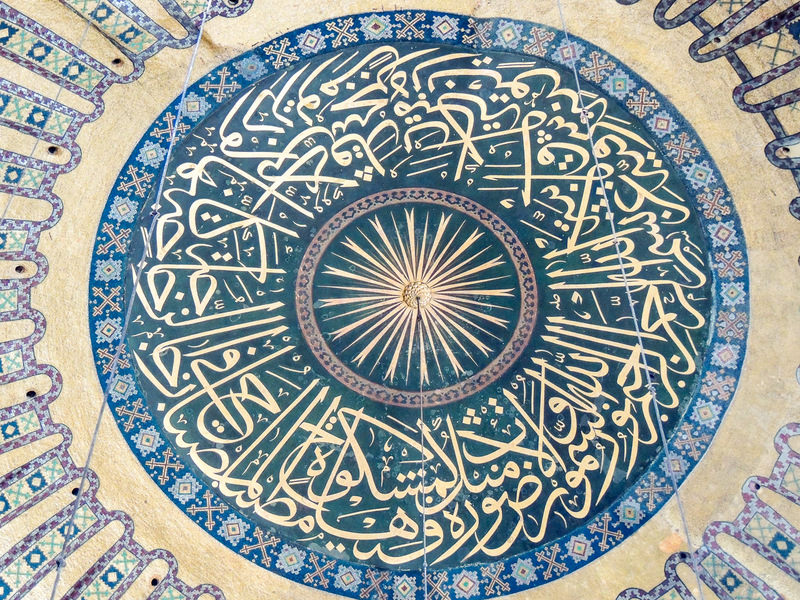 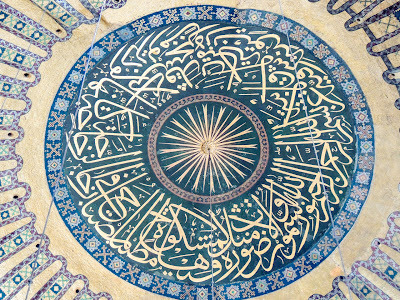 It became a jewel for the Muslim world and served as the grand mosque of the sultans. 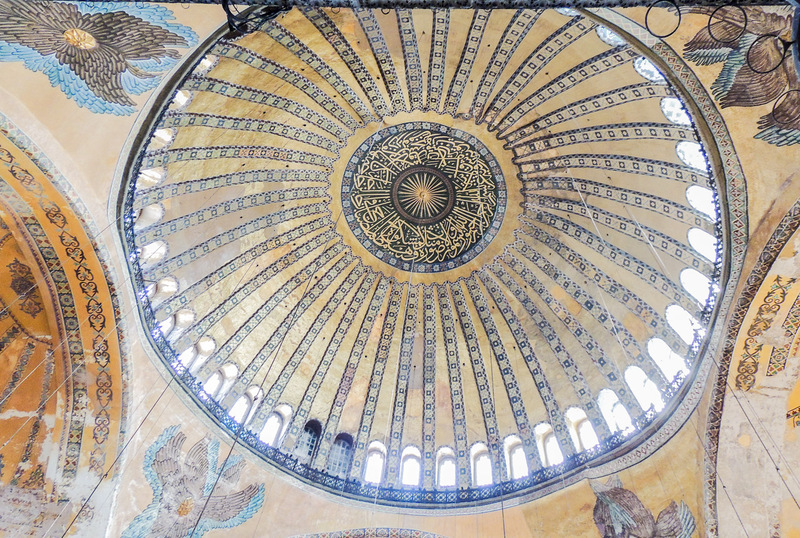 The dome symbolically reaches up to heaven and is guarded by four seraphim (members of the highest order of angels) on the 4 huge columns that carry the dome. The 4 seraphims' faces were covered with layers of plaster for almost 160 years during the sovereignty of the Ottomans. 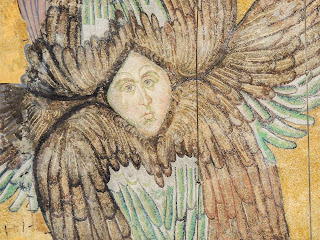 Recently the face of one of the seraphim's was revealed. 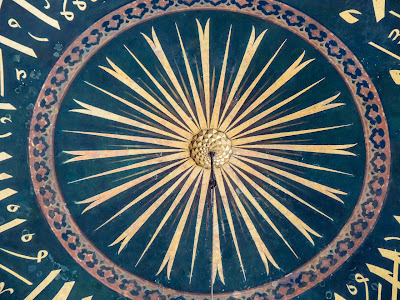 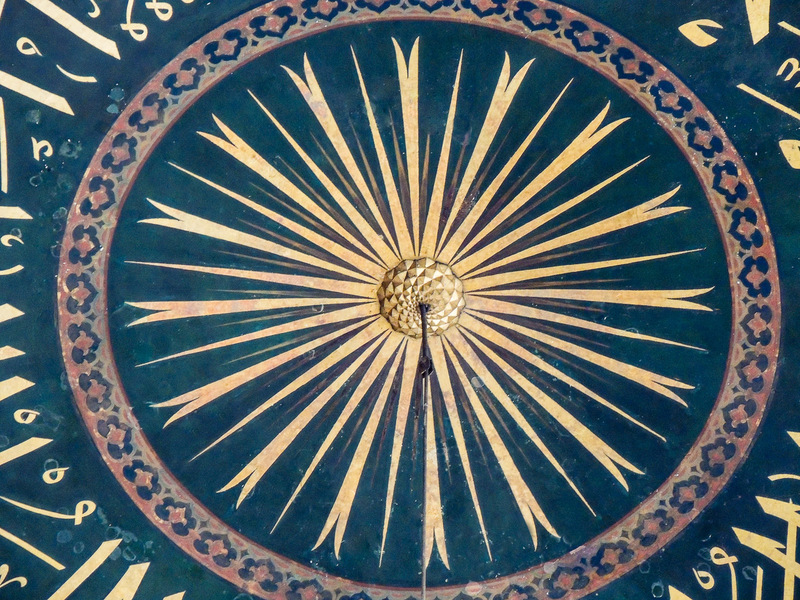 The uppermost part of the dome--"the top of heaven"
The upper gallery is reached by a winding ramp. 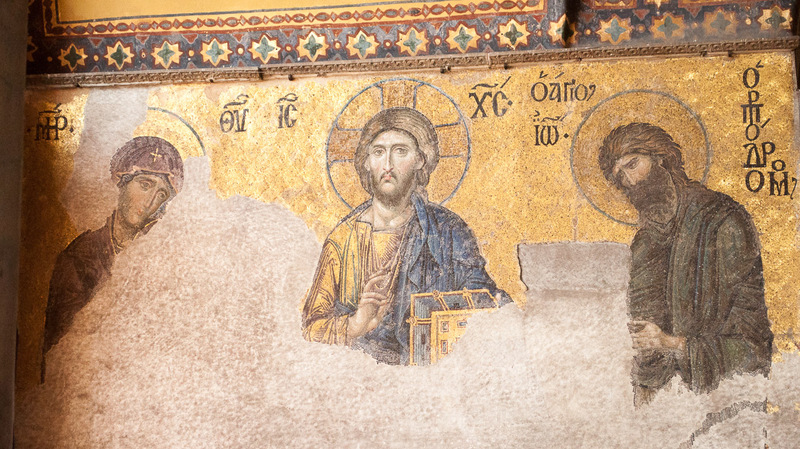 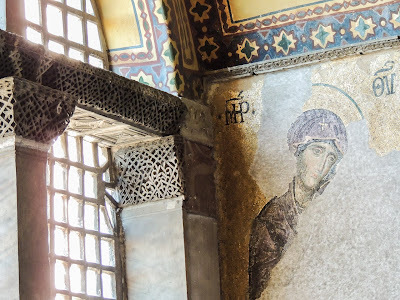 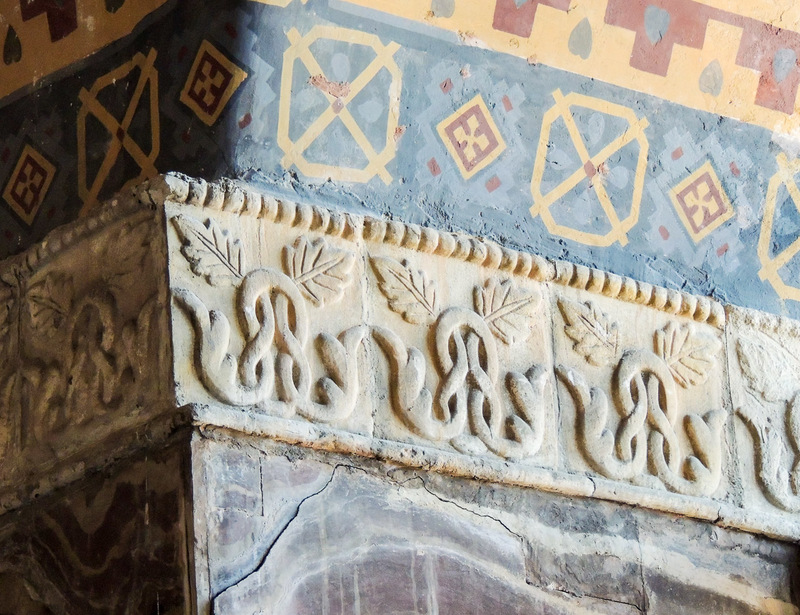 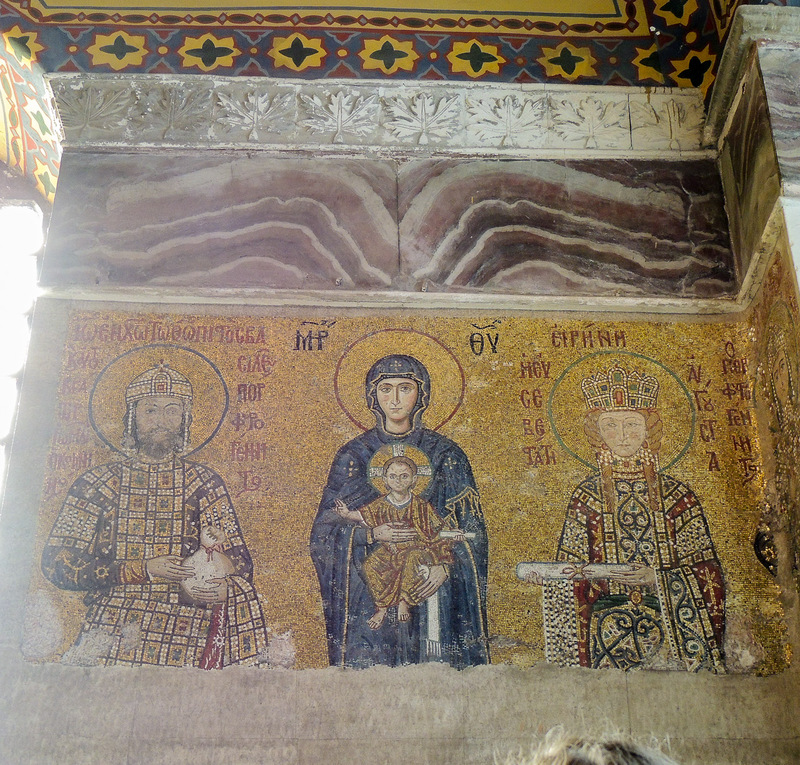 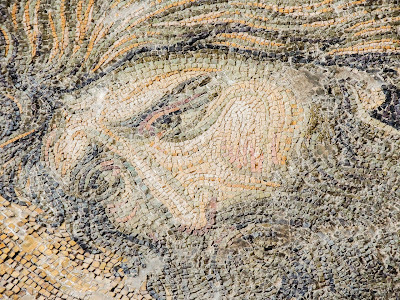 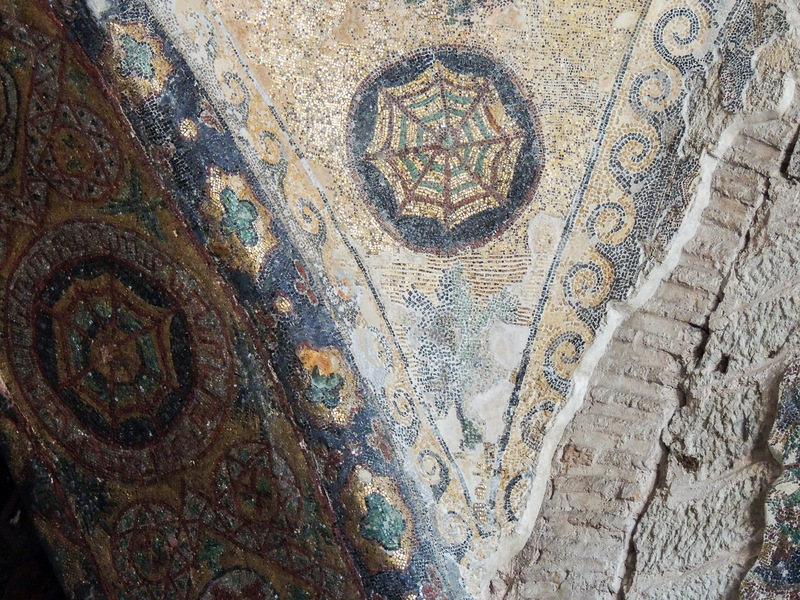 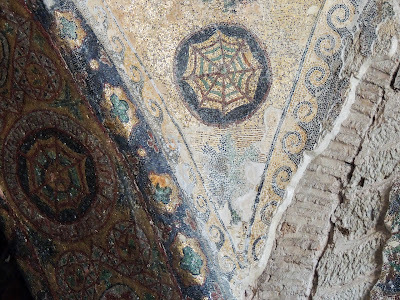 Among other things, several beautiful mosaics are preserved up there. 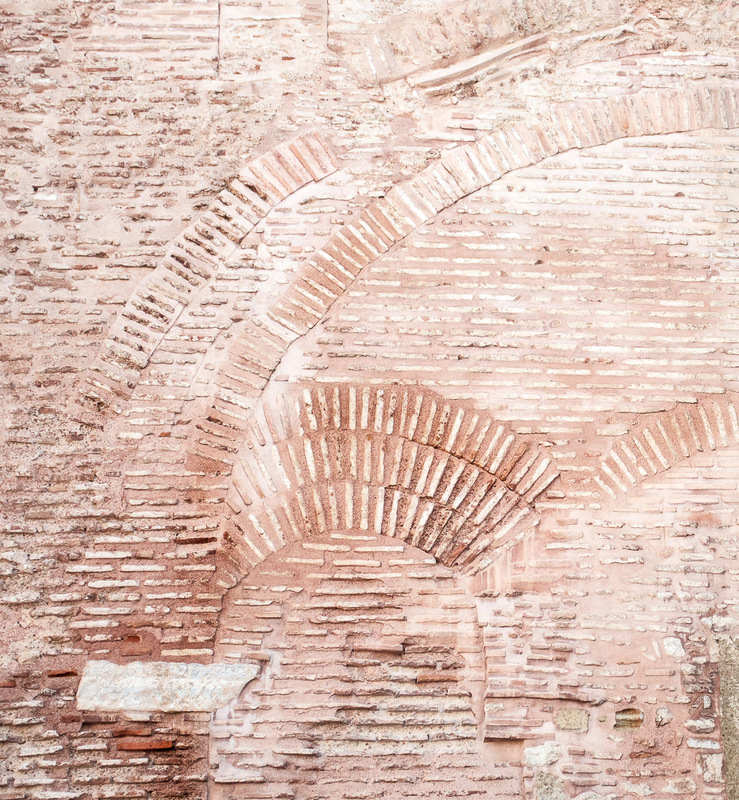 First, let's go up and look around! 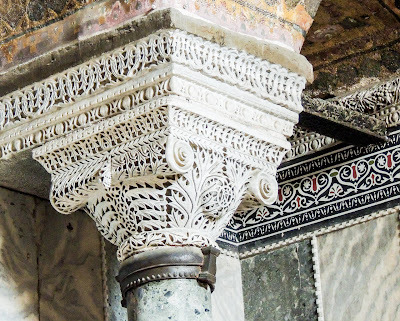 Marble carved so finely it looks lacy. 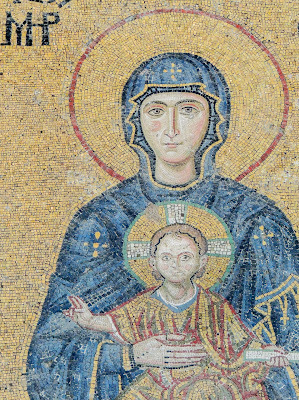 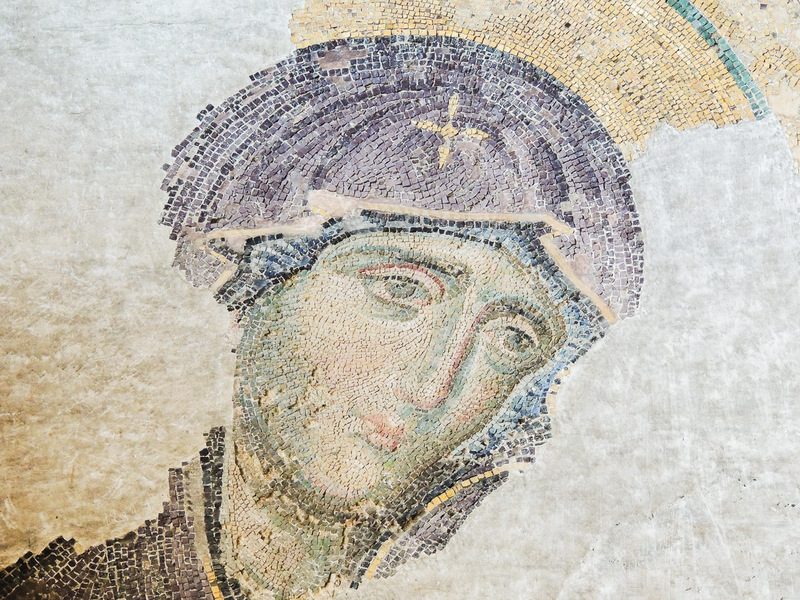 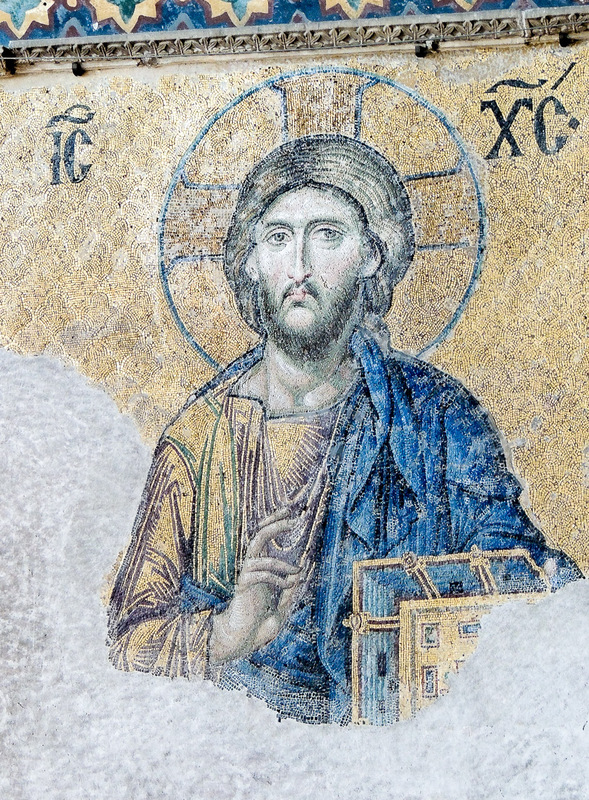 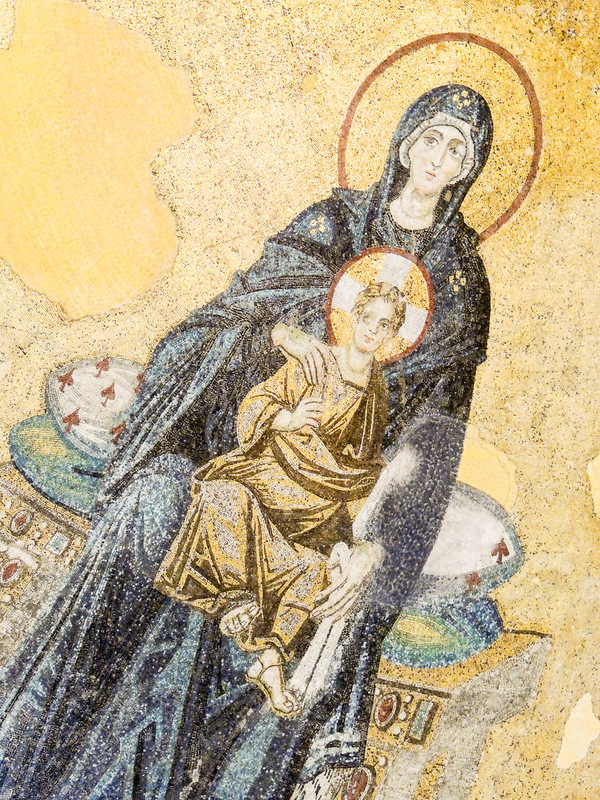 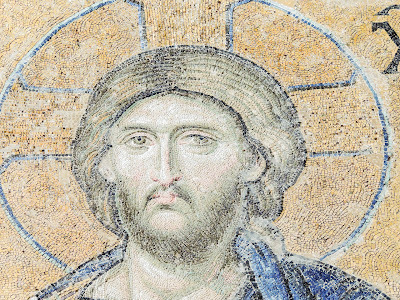 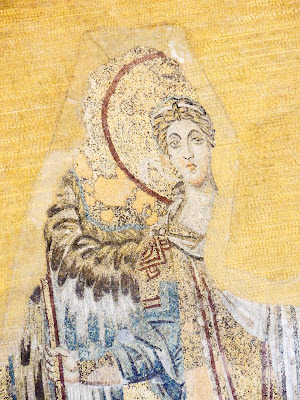 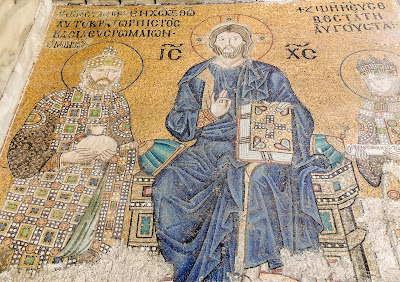 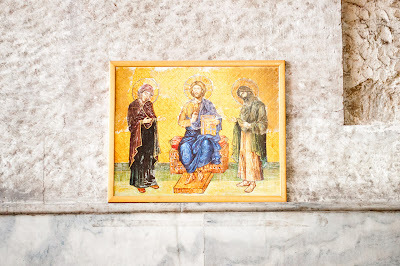 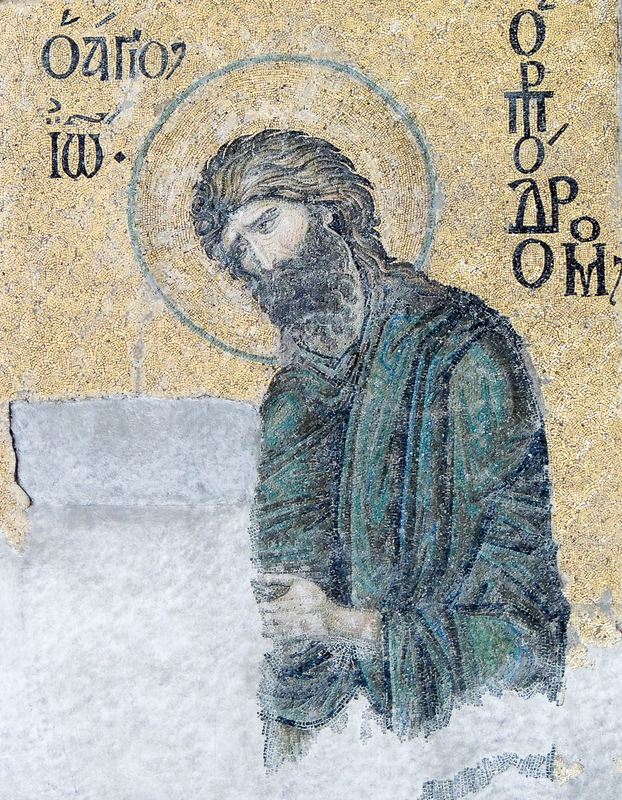 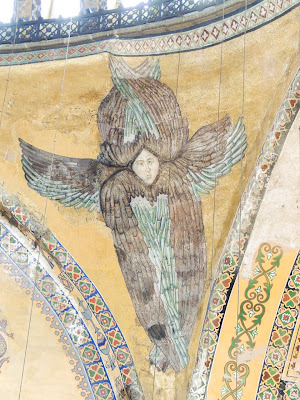 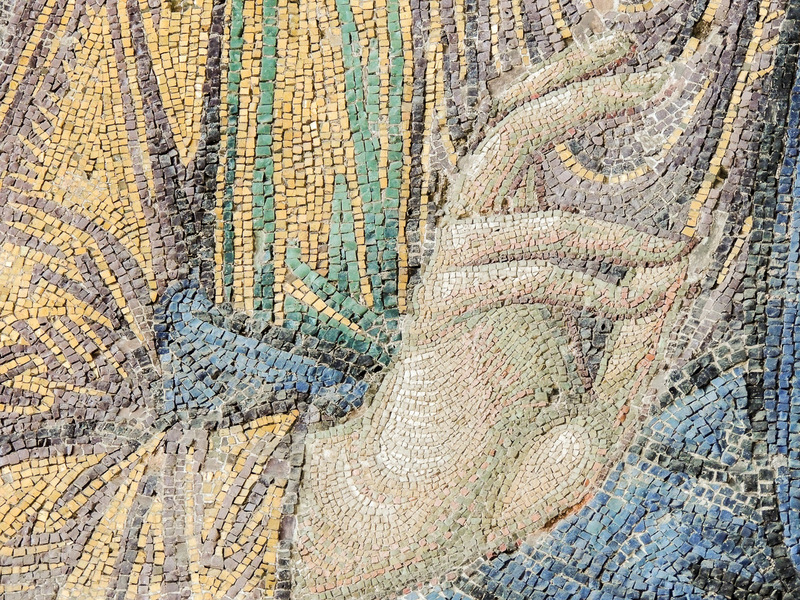 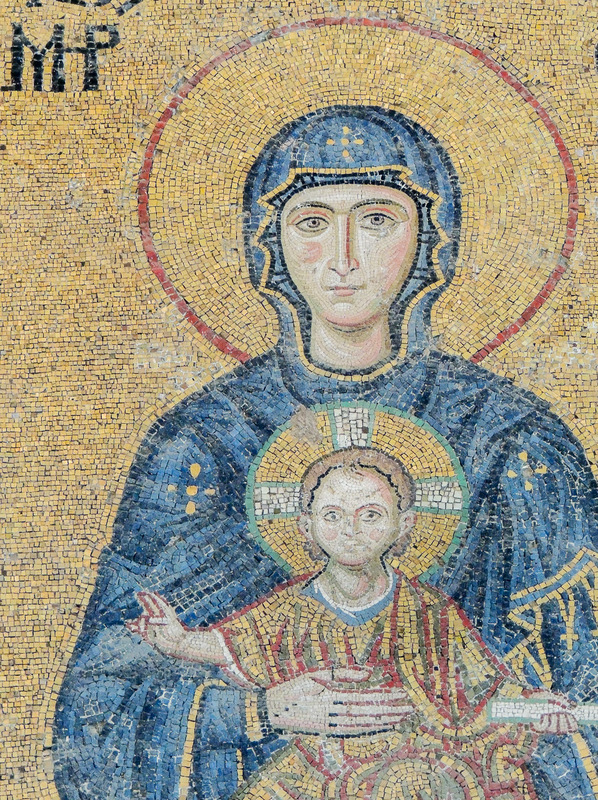 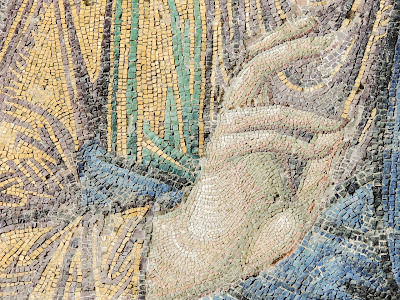 This mosaic is widely considered the finest in Hagia Sophia, because of the softness of the features, the human expressions and the tones of the mosaic. It probably dates from 1261. In this panel the Virgin Mary and John the Baptist, both shown in profile, are imploring the intercession of Christ Almighty for humanity on Judgment Day.